Ground work for Phase 1 of this project began mid-May 2016 and will be concluded when this ribbon is cut. The two million dollar project was funded, in part by a $850,000 grant from the NJDEP Green Acres Fund and a partnership with Nexus Properties. Engineering services were provided by Sickles & Associates, Inc. Architectural services provided by Clarke Caton Hintz Architecture. The Crowning Jewel is Glassboro’s New Veteran’s Memorial Plaza which is our proud tribute to America’s Veteran’s. 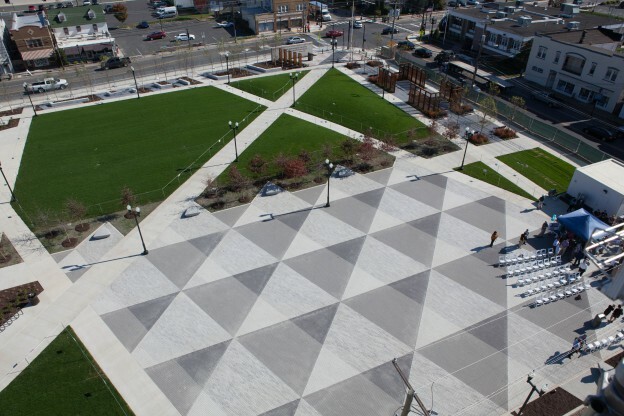 The Town Square’s essential feature is open space, and it’s essential function is sociability. “Formally a series of underutilized buildings, evolving into a beautifully programmed 1.75 acre park space. This hub will be animated with patios and retail uses spilling into the public space, as well as daily, weekly, seasonal and annual events, festivities and rituals, creating a vibrant and exciting energy. This entry was posted in News on October 21, 2016 by Kathy Ward.